When Fetcherfly Golem takes damage and survives, summon a 2/2 Fetcherfly Swarm. 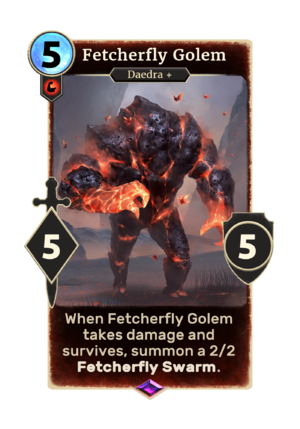 Fetcherfly Golem is an epic Strength creature card. It is part of the Houses of Morrowind expansion. Fetcherfly Golems first appeared in Online: Morrowind. This page was last modified on 13 October 2018, at 06:45.